I wonder if the Barebones "Barbados" Superhet was in this batch. So now I have THREE BITX transceivers on the operating bench. I've been getting tired of moving the old D-104 around as I change bands. Surely each of these rigs merits its own mic. This would allow me to avoid the hassle of having to adjust the level on the D-104 each time I change rigs. Fortunately in the junk box I have some useable old mics. An old "Turner SSB+2" mic has been kicking around in there for decades. I probably got it when I was a kid. 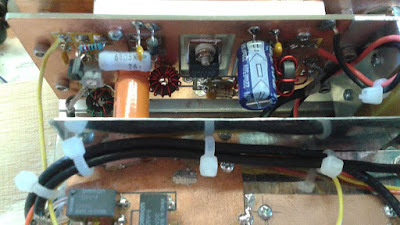 The element was no longer working, so I just popped an electret element in there, took out the preamp circuit, but kept the adjustment pot. At first I had a 3.3 uF coupling cap in there at the output, but this was letting too much 300 Hz energy through. So I changed the coupling cap to .1 uF and this seemed to even things out a bit. I know, I know: It is CB gear. It is painted BLUE and it looks like something George Jetson would use to talk to his interstellar Good Buddies. But it was preceded by a very similar mic made for hams (see above). And I like it. It even has the word "Transistorized" emblazoned in script across the PTT bar. Brace yourselves. This is almost too much. Prepare for sensory overload and possible palpitations. Wow. This is really amazing. Note the very casual way Paul manages to mix Eico 430 oscilloscopes with the latest Tek touch-screen 'scope. 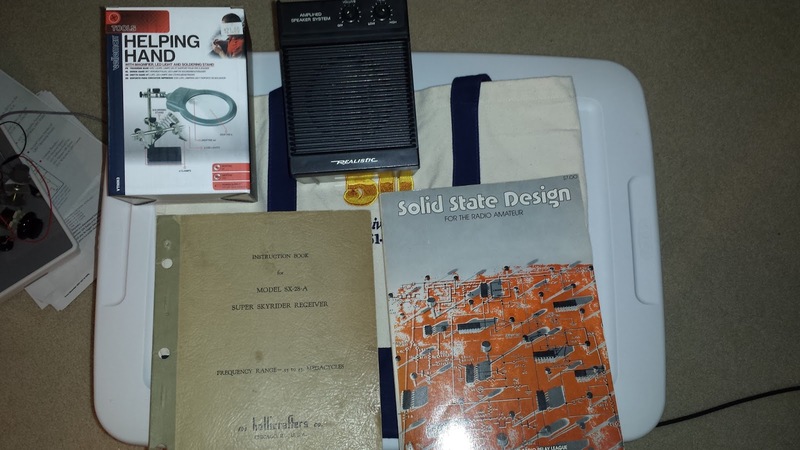 Heck, the doesn't even mention the SP-600s! He does briefly note "a very large transmitter." Indeed. And he has a microscope on the bench. This video is part of an excellent YouTube channel called "Mr. Carlson's Lab." Great stuff in there. Paul works on everything from old tube type receivers to modern Yaesus and Icoms. It took me a little digging to find his ham radio call sign. 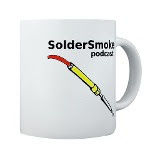 There are many Paul Carlsons on QRZ.com, but Paul's pronunciation of "solder" gave him away. It seems our Canadian friends also (like the Brits) pronounce the "L." VE7ZWZ. Stefano IZ3NVR sent me HA5KHC's very interesting web site. Lots of ideas here. 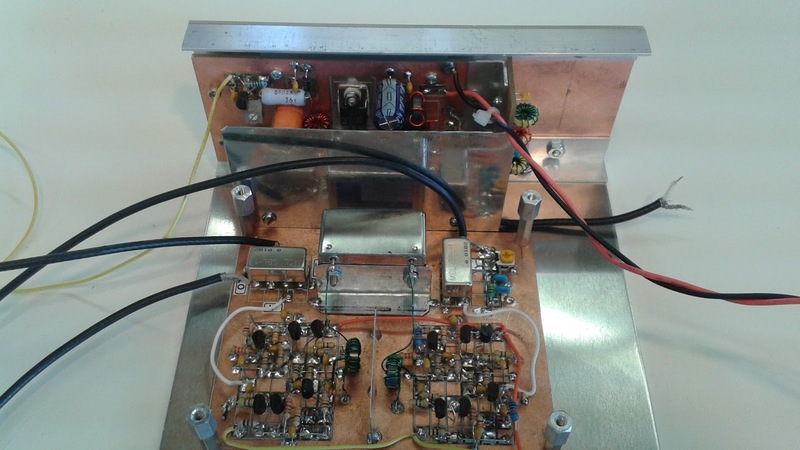 For example, check out WA7JHZ's 75 meter SSB transceiver. I like the RF amp along the back with the LP filter off to the side. The stacked PC boards are very nice. The Display -- What can I say? Having stations from the Philippines (DU) for the receiver demo. Nice touch. Mesh-like side panels! And the plexiglass top! Wow! PAINTING THE COPPER-CLAD FRONT PANEL BLACK! WOW! BLACK IS THE NEW COPPER! Nice feet for the rig. Feet are key. NO NOTICEABLE PHASE NOISE. No Si5351 output bleed-over. I've been playing around with a little $13 DVB-T SDR Dongle receiver. 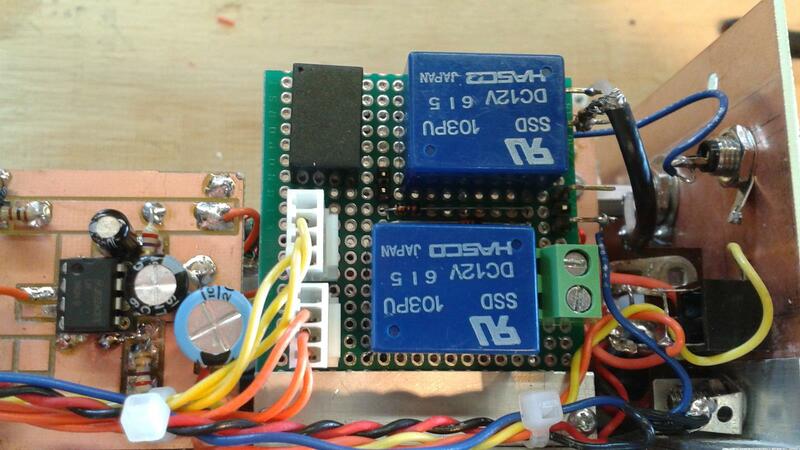 These devices normally tune 24 MHz to 1.7 GHz, but I modified the first one I had so that it would tune the HF bands. 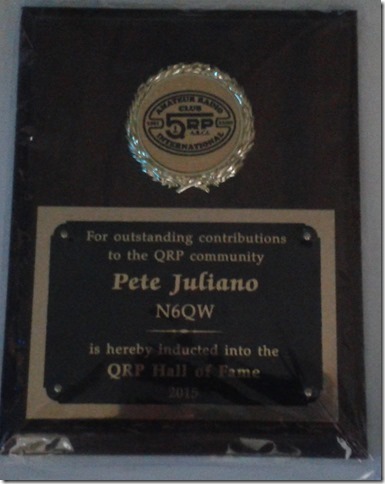 Pete then sent me another one, which I vowed to keep unmodified, thinking that it would be fun to use it to listen to the many small Cube-Sats that are up there. Most have downlinks (and Morse Code beacons) in the 470 MHz range. I whipped together a simple ground-plane antenna for this band (One 6 inch copper wire as the receive element with 4 five inch groundplane elements). I then went to the "Heavens Above" website, plugged in my location, and clicked on "Amateur satellites." This gave me a very accurate schedule of satellite passes. I started listening. 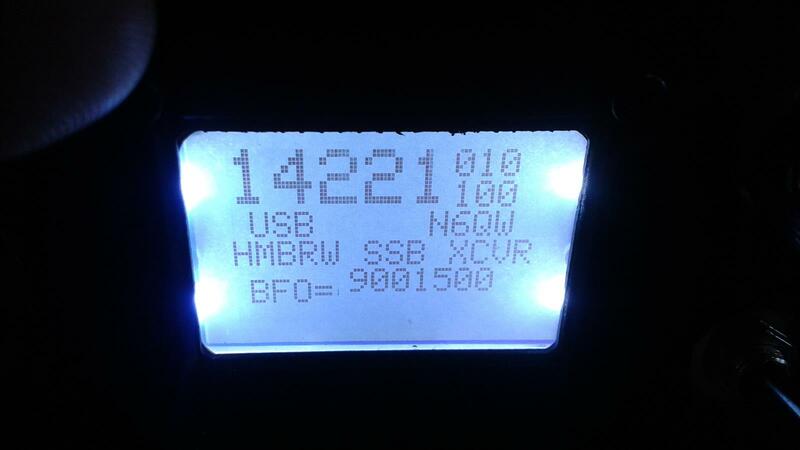 First I heard (and saw in the HDSDR waterfall) the CW beacon of the Prism satellite at 7:05 am EDT today. Prism is from the University of Tokyo and was launched from Japan. Then Cubesat XI-V at 0711 EDT. Cubesat XI-IV was heard at 0813 EDT. 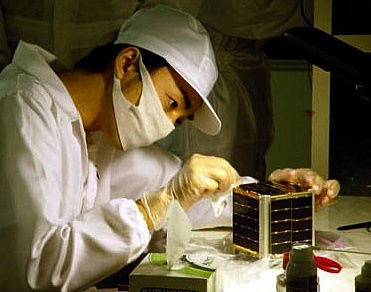 The Cubesats are from Japan and were launched from Russia. ITUsPAT was heard at 1422 EDT. The I is for "Istanbul"
Finally, I monitored a pass of the Japanese FO-29 satellite aka JAS-2 at 1611. Wow, this was like old times on the RS-10 and RS-12 satellites. Lots of CW and SSB stations in the downlink passband. Lots of fun. At 470 MHz the Doppler shift of a low-earth orbit satellite is quite noticeable, and helps confirm that you are in fact receiving sigs from an orbiting device. I thought it was pretty cool to take a $13 DVB-T Dongle, connect it to a small, copper-wire antenna, and use it all to receive signals from some 4"x4"x4" cubes in orbit of the Earth. "There are claims that, after initial chaos, eventually the letter Q was chosen because of the popular TO18/TO39 case styles." 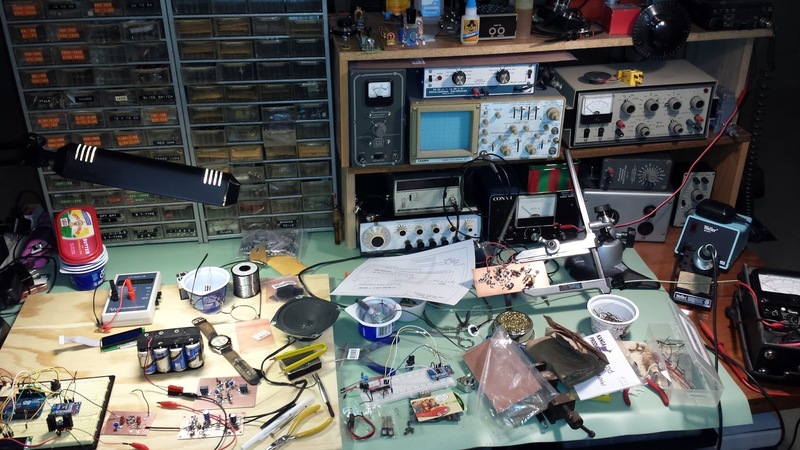 Peter Parker has a double dose of The Knack: Not only is he a great rig builder, but he is also a very skilled teacher. His videos provide really excellent descriptions of how he selects, designs, and modifies the stages that make up his magnificent rigs. You can learn a lot from these videos. Thanks Peter. Why are relays marked "K" on schematics? It is practically SPARKLING! Beautiful job Pete. I'm glad you are actually boxing this one up! He also notes that there may have been some sub-conscious Knack wisdom at work when I dubbed his rig "The Zia." I was thinking strictly in terms of language and ethnic heritage: TIA stands for Termination Insensitive Amplifier. But in Spanish it means "aunt". But in Italian Aunt comes out as Zia. So Pete's should be a Zia, right? Capisce? "Once again you are spot on with ZIA (With Z the electronic symbol for Impedance). Thus Impedance (The symbol Z) Insensitive Amp. Thank You." Brilliant! Great stuff! Lots of fun! Another great idea from Peter Parker, VK3YE. -- Farhan's New Minima -- Crying out for an Si5351? -- A ham rite of passage: Build a Dipole! 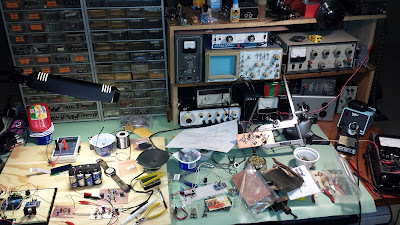 -- What does your shack look like at the end of a project? 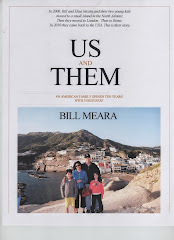 Termination Insensitivity -- Only Three TIAs in the World? Termination Insensitivity. Is this like when your girlfriend dumps you and you just don't care? Wes Hayward and Bob Kopski developed the Termination Insensitive Amplifier circuit back in 2009. With a bidirectional rig it is important that the crystal filter face the same impedance in both directions. Simpler bidirectional amps are impedance "transparent" in that their input impedance depends on what is on the output (and vice versa). The circuit that Wes and Bob developed solved this problem: these amps always look like 50 ohms. That's very useful. When I was building my earlier BITX rigs, Farhan suggested that I try the termination insensitive amp circuits. On my latest project I followed his suggestion. 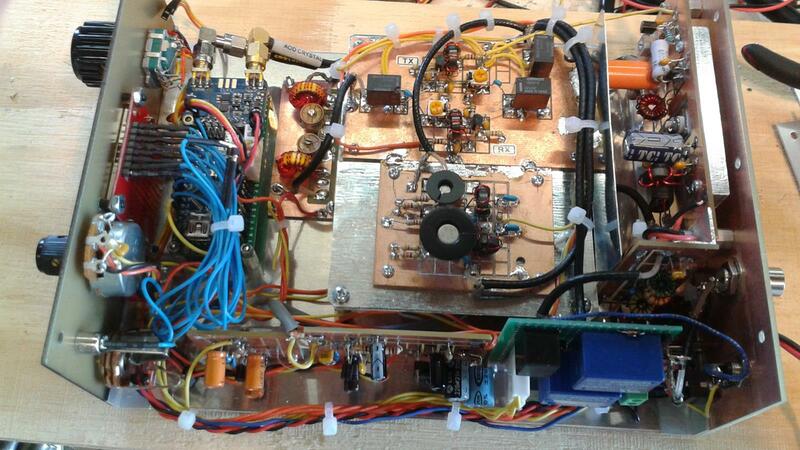 At the same time, Pete was building a new BITX, also using the TIA amps. Please let us know if you know of any other TIAS (or ZIAS!) out there. BITX DIGI-TIA Build Update #7: On The Air! 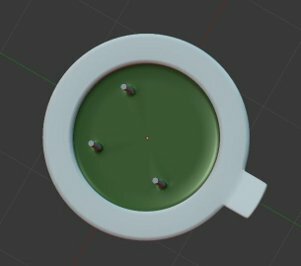 The plug in filter arrangement seems to work very well. This will allow me to put this rig on many other bands. All I have to do is build some additional filter boards and upload modified versions of the software. 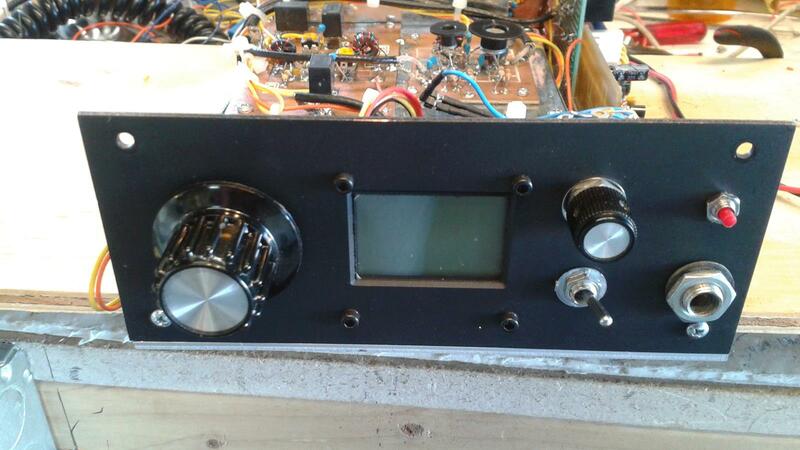 There is even space to make a plug-on socket for the crystal filter (the 9 MHz IF would not be cool for 17 meters). I'm really pleased with the RF power chain (the original BITX chain). 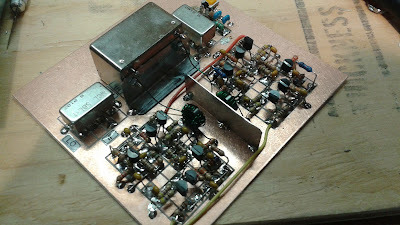 This time I built it all in a straight line along the back of the transceiver with lots of attention to shielding and grounding. There were no instability problems. The amplifiers did not try to be oscillators. I was shocked! I did have to reduce the gain of the three termination insensitive transmit amplifiers. 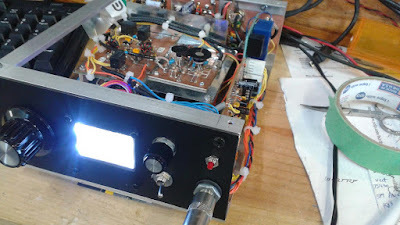 Using the chart in the 2009 Wes Hayward/Bob Kopski article, with just a few resistors you can set the gain. I had built them with 19.4 db gain each. 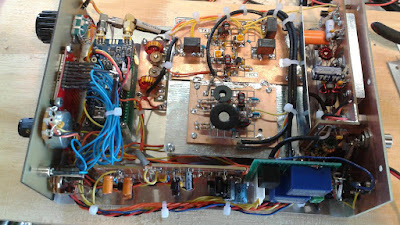 This turned out to be too much -- the slightest amount of audio into the SBL-1 was driving the amplifiers to peak output. So yesterday I changed all three amps to 15 db (I think that was what Farhan had in the original BITX). It only took me about 15 minutes and it seemed to take care of the problem. 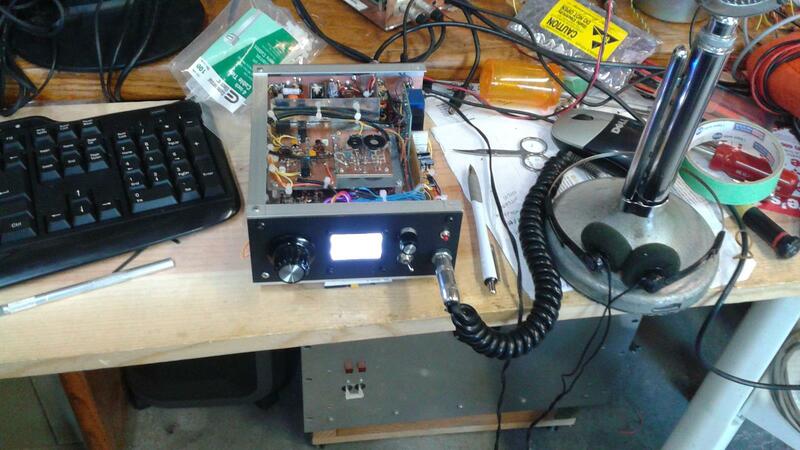 I am getting 7 or 8 watts out of the IRF-510. T/R switching is very smooth and quiet using just two small 12V relays. Thanks to Pete for the mil-pad boards and the encouragement (especially on the use of the Si5351). Thanks to Farhan for the BITX architecture. 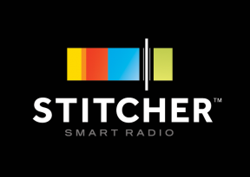 Thanks to Steve Smith for the Yaesu filter. Thanks to Wes and Bob for the TIA circuit. Thanks to Thomas in Norway for the Si5351 software. And Thanks to Allison for all the good advice. ... While the transverter for 144 MHz was being tested out into my new homebuilt antenna I tried receiving the French space surveillance GRAVES RADAR on 143.050 MHz. It is easily detected here in Scotland via meteor scatter. It is also so strong that passing space hardware like the ISS reflect the RADAR and can also be detected, showing up on FFT displays with their rapid Doppler shift. GRAVES is also easily detected by moonbounce, I could see it and hear it on my single 10 element yagi pointed at the horizon without a preamp. Even when the moon was at 15 degrees elevation here, and even higher in France the signal was strong enough to be picked up in one of the lobes of my antenna. You can actually see what the vertical pattern of the antenna looks like as the moon rises through the peaks and nulls of the antenna in conjunction with the constructive and destructive interference patterns caused by ground reflections and the direct path to the moon. Earlier this year Pete and I were talking about the use of the word "rig." For me this is a hallowed term that captures much of the essence of ham radio. Sadly, in modern parlance "rig" seems to be increasingly substituted by word "radio." If you are wondering what the difference is, well, I think this video presents a good example of a rig. I've operated a breadboard rig just to watch the electrons move thru the circuits but never worked such a kluged station yet. I worked some lashups like Mike's. I still do. Once upon a time I "temporarily" taped a T-R relay under a shelf and used it temporarily enough months for it to come untaped and fall in the middle of a QSO! I finished the QSO anyway. I don't tape relays to the bottom of shelves any more but the top of the shelf is fair game. No relay ever fell *up*. I've worked Mike on the air. We have some of the same views. The links recently went bad, but fortunately Jim W8NSA saved the old site (most of it). Thanks Jim.